“COME AND FIND YOURSELF” they said. I had never felt so grown-up. Maybe this was a mind-set that Stan’s Cafe had attempted to instigate. Reading all of the perfectly typed labels as a make-believe business-woman gave me an insight into what it was like to view people as numbers. I look up from the label and acknowledge the city skyline. I feel powerful. I watch a man run for a bus filled with more men and women and children. There are people out there. The artificial sense of supremacy that the artists manage to create fades quickly, and yet lasts long enough for you to realise how easy it is for authoritative individuals to become detached from the society that they are supposedly a part of. 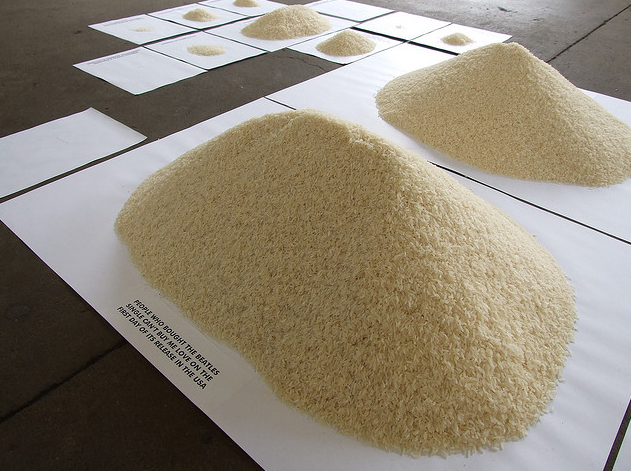 One grain of rice is you. As you read the labels, the words become more and more meaningless. You begin to read the visual feast rather than the words. The tone of the labels is cold and emotionless; robot-like. It mimics the language used by journalists who have no interest in the people that they write about. As you travel around the exhibition, you are forced to reflect upon the way that you relate to the statistics. Where can you place your own grain of rice and where do you want to be able to place yourself? The constant, flowing feed of statistics and facts resembles that of an online community – a beautiful juxtaposition of facts that mean nothing when apart, but paint a poignant picture when placed together. Even the way that the rice is placed forms juxtaposition, from squared to rounded piles, large and small, towering and short. It is incredible that every aspect of the instalment seems to remind you of the many different forms that society takes. One section was themed around Catholicism, one A4 piece of paper labelled ‘PEOPLE ATTENDING MASS WITH POPE BENEDICT XVI, COFTON PARK, BIRMINGHAM, 19/09/2010’, ironically towering over a neighbouring page labelled ‘CARDINAL JOHN HENRY NEWMAN’. Suddenly, you are inclined to question the hierarchy within the church community. There is something strangely captivating about the accessibility of this exhibition. You could reach out and grab handfuls of these people. The only thing preventing you from doing so is your morals – the walls that you’ve built to protect yourself. You may feel encouraged by Stan’s Cafe to knock these down, metaphorically of course. In a world where we are constantly moving and rushing past each other, it is easy to forget how connected we are. We are linked together via both meaningful and meaningless statistics. This exhibition will take you on a journey of self-discovery. Allow yourself to question your place in society and you may just reap the benefits. This review was written by 17 year old Christina Sabbagh from Fierce Press Gang 2013. Of All The People In The World is an exhibition by Stan’s Cafe that was exhibited at Two Snow Hill from Friday 12th April – Sunday 21st April. More information can be found here. Fierce Press Gang 2013 offers young people from Birmingham insights into the entrepreneurial aspects of working on a festival, as well as masterclasses in digital journalism. Fierce Press Gang culminates in an opportunity to cover the Fierce Start Party 2013 on Saturday 27 April in Birmingham, a multi-artform event unveiling the different aspects of the festival. Supported by online magazine This Is Tomorrow, the group will interview Fierce artists, document events and offer feedback. Their activity will be published on the Fierce blog and This Is Tomorrow website. Fierce Press Gang 2013 is funded by Birmingham City Council.